Every girl has a different goal when it comes to Halloween. Some girls like to bring in a huge haul of candy. Some want to wear a pretty dress and pretend they're the princess of some kind of fantasy land. Other girls? Well, they just want to put a scare into all their friends and family. 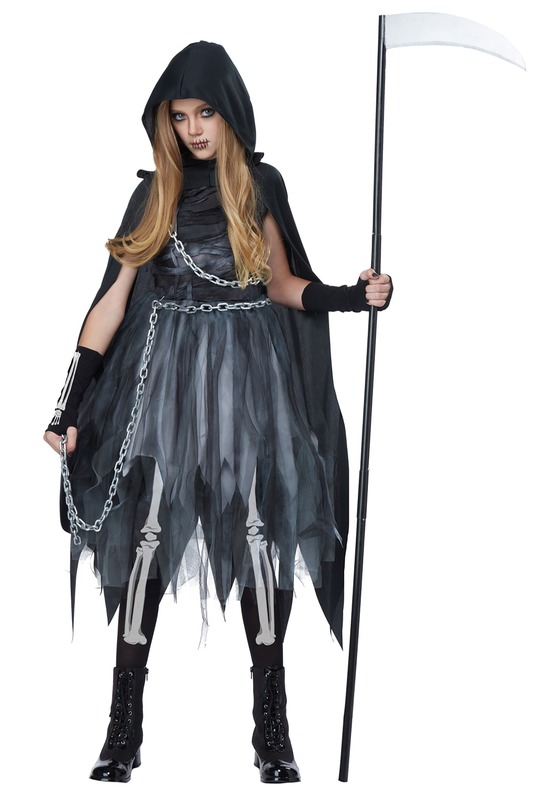 Girls like that don't want frilly dresses; they want something dark and creepy, and your girl can wear the frightening look she craves with this Reaper Girl Costume! Now, we know reapers are best known for being the grim looking ghosts (are they actually ghosts, or some other kind of supernatural being?) that collect and deliver the souls of the recently deceased to the afterlife. However, they also have the lesser known job of serving as ominous symbols of doom, and just seeing one lurking in the background is often all it takes to give someone a chronic case of the chills. This isn't some cute princess dress, like something out of a happy fairy tale. 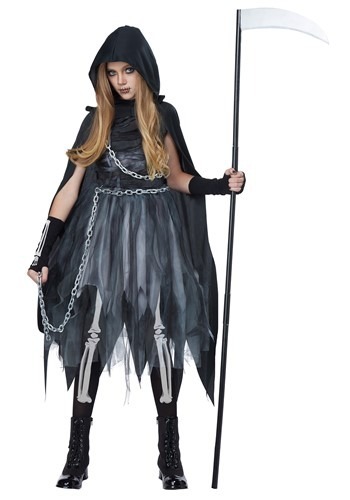 This dark, gothic outfit is just the type of intimidating look that's fit for the personification of Death. With screen printed skeleton details on the glovelettes and leggings, and gray mesh overlays under the cloak to give her a ghostly vibe, it's a pretty quick way for her to begin her new job of harvesting souls. Just remember to gear her up with a scythe, since she's going to need it to impose her scary new job upon the world! My eight year old loved the costume. Everything about it was excellent. I liked the quality and the size was accurate. Awesome,scary,cool,and surprisingly comfy.Arrived on time and my daughter LOVED it. Arrived on time.Stretchy and fit really well.Really great detail.and most importantly,very creepy! and hard to break. And the costume is well made. I enjoyed trick-or-treating with it and I got a dozen compliments and the makeup was really easy. A great costune, but the chains break easily. Very well made product !